Although lychee was introduced to Australia more than 60 years ago, major commercial plantings only commenced in the 1970s. The crop can be difficult to grow and yield consistently. The major problem is irregular flowering and poor fruit retention, while alternate bearing and small fruit size reduce grower returns in some districts. Trees take three to five years to come into production, and will not produce substantial crops until year six or eight. They require regular chemical control measures for pests and suffer heavy losses to birds and fruit bats if not netted. The fruit only ripen on the tree and have a very short shelf-life without refrigeration. Successful production requires an experienced horticultural manager able deal with irrigation, tree nutrition and considerable pest load. You also need to have efficient packing and cool room facilities as the crop deteriorates very quickly after harvest. Australia has an advantage in the international market with production during the Northern Hemisphere off season including the lucrative Christmas and Chinese New Year festivities. Demand for high quality product far exceeds Australias ability to supply. There are also opportunities in the domestic market, although some promotion and retail/consumer education are required. About 50 percent of production is in northern Queensland (Cairns, Ingham, and the Atherton Tablelands), 40 percent in central and southern Queensland (Rockhampton, Bundaberg, Gympie, Nambour and Caboolture) and only 10 percent in northern New South Wales (see map). The season lasts from about October in northern Queensland to March in northern New South Wales. Longan trees are often grown in the same orchards. Production of longan, however, is much smaller, with less than 1,000 tonnes. Trees perform best on well-drained clay loam soils of medium to high fertility, with a minimum of one metre of well-drained topsoil. Trees may die on heavy clay soils, which become waterlogged. There can also be problems on very sandy soils during hot weather in northern Queensland. Slopes greater than 15 percent are best avoided as they will not allow safe use of machinery for pest control, tree management, harvesting and may lead to erosion. Lychees require a period of cool weather (15° to 20°C) for successful flower initiation, but may be killed by frosts. Hot dry weather after fruit set has also been implicated in fruit drop, fruit browning and splitting. Fruit under these conditions do not develop full red colour. Trees are also susceptible to wind damage, and should be protected by windbreaks. Irrigation is normally required to produce commercial crops, but care must be taken with water quality. Water with an electrical conductivity of more than 600 to 1,000 mS per cm or dissolved salts of more than 500 ppm may reduce productivity. It is generally considered that about two to four ML of stored water is required for each hectare of trees. One person should be able to handle about 5 to 7 hectares of mature trees without the need for other staff, except during harvesting and packing. Depending on the yield and spread of cultivars, up to five to ten staff would be required for harvesting over summer. Basic equipment required would include: an under-tree sprinkler irrigation system, tractor, sprayer, slasher or mower, trailer, harvesting equipment, netting and a packing shed and cold room. There are over forty cultivars in Australia. However, the development of the industry has been hindered by lack of performance data for the major production regions. This has been accentuated by difficulties in identifying cultivars. Highest prices are paid for early and late fruit with strong skin colour, firm flesh, aromatic flavour, high proportion of edible flesh and small seed. Cultivars currently being planted in northern Queensland on the Atherton Tablelands and coast include Kwai May Pink (Bosworth Number Three), Fay Zee Siu and Souey Tung, the later two being quite early. Kwai Mai Pink is also popular in central and southern Queensland and in northern New South Wales along with Salathiel, and the late cultivar Wai Chee. New orchards are usually established with marcots or air-layers. These sell for about A$ 10 each and are supplied by private nurseries. Many growers propagate their own material. Trees can also be propagated by grafting and cutting, but typically these have only been used for research experiments. Lychee cuttings are slow to establish in the field, while there can be incompatibility between some cultivars and rootstocks. A well-managed orchard should have a long commercial life. Hence, close attention to orchard layout and land preparation will have their rewards for many years. Growers need to make decisions on row direction, spacings, placement of waterways and drains, mounding, wind protection and all weather access to the block. Local horticulturists can help with the layout of the orchard and care of young trees. Details are also available in the Queensland Department of Primary Industries Lychee Information Kit. Plantings generally range from 100 to 300 trees per hectare. Recommended spacings are 12 m x 6 m for spreading cultivars such as Fay Zee Siu and Souey Tung (equivalent to 140 trees per hectare), and 6 m x 6 m for upright or low vigour cultivars such as Kwai May Pink, Salathiel and Wai Chee (equivalent to 280 trees per hectare). Internationally, higher density plantings have given greater returns, but these types of orchards are only experimental in Australia. Tree rows are usually considered to best run north-south, but erosion and operator safety should be considered. Strong winds can seriously affect tree growth and production, so windbreaks need to be considered in most localities. A soil analysis (including soil pH) before planting will indicate any potential nutrient deficiencies or imbalances, which can be corrected. These results can be discussed with local horticulturists. Some soils need an application of lime, phosphorus, nitrogen and some organic matter into the planting site. Many growers plant a manure or cover crop before planting and incorporate this organic matter into the soil to improve soil texture, fertility and orchard establishment. Irrigation is generally considered essential for regular production in most of the commercial growing areas of eastern Australia, and is normally provided by under-tree sprinklers. These systems can also be used to fertigate trees. In dry areas, the young plants will generally require watering at least weekly until they are well established. Horticulturists demonstrated that it is possible to prune lychee orchards in Australia to maintain tree size and promote flowering and cropping. This was a collaborative project between the Queensland Department of Primary Industries and CSIRO Plant Industry with funding from the Rural Industries Research and Development Corporation (RIRDC) and the Queensland Fruit and Vegetable Growers (QFVG). This work followed on from research in Israel. These workers developed a model of flushing against radiation and temperature that was used to predict the optimum time of pruning along the eastern coastline of Australia. This model was then validated in commercial orchards. The model showed that flushing is slower in the southern, cooler, cloudier areas (e.g. Ballina in northern New South Wales) and that pruning must be carried out much earlier than in the northern, warmer, sunnier locations (e.g. Mareeba in northern Queensland); (see Figure 2). Should a tree fail to flower in autumn, a second opportunity can be provided using ethephon as a selective desiccant to remove young growth and promote the initiation of a new flush. Trees pruned at the optimum time were shown to have similar yields on a canopy surface area basis as productive non-pruned control trees. Figure 2. Latitudinal variation in the estimated optimum date of pruning for lychee in eastern Australia. Work in South Africa with Australian horticulturists showed that a severe drought from just after panicle emergence through to harvest reduced both yield and fruit size in Tai So, such that the gross return per tree dropped from A$ 250 to A$ 35. However, in Australia, a mild drought after flowering actually increased yield, although this was at the expense of fruit size. These two studies showed that lychee trees are capable of extracting soil water at considerable depths in most soils, and can produce acceptable yields with fairly long intervals between waterings. Many orchards in Australia are watered two to three times per week, but this may be excessive. Indeed, in wet growing areas, such as those around Ballina and Nambour, irrigation might be ineffective in many years. In somewhat drier areas, however, such as those around Mareeba and Bundaberg, irrigation is likely to be far more important, especially for successful panicle growth, flowering and fruit development. Irrigation is preferably related to actual water use by monitoring soil water levels with a neutron probe or an Enviroscan system. Tensiometers are less reliable. An acceptable cycle in a sandy loam soil would be two to three weeks, and considerably longer in a clay soil with greater water holding capacity. Irrigation in a sandy loam soil before 50 percent of the available soil water is used would maintain tree water levels in the acceptable range. The soil profile should be brought back to field capacity with every irrigation. Suggested amounts for well-grown trees at year ten are 1,000 g N, 450 g P and 1,200 g K. Results indicate that lychees are not likely to respond to fertilizers in the season of application. Nor is it likely that the timing of fertilizer applications will affect yield. For most nutrients, there is little impact on production over a fairly wide range of leaf nutrient concentrations. Badly run-down trees, however, may take many years to recover. The cost of soil and leaf tests is small compared with the savings to production, fertilizer costs and the environment. Nutrition is based on leaf and soil standards developed from surveys of high-yielding trees in the late 1980s, with samples collected after panicle emergence in winter. Leaf standards are: 1.5-1.8 percent for N; 0.14-0.22 percent for P; 0.70-1.10 percent for K; 0.60-1.00 percent for Ca; 0.30-0.50 percent for Mg; 50-100 mg per g for Fe, 100-250 mg per g Mn; 15-30 mg per g for Zn; 10-25 mg per g for Cu; 25-60 mg per g for B; <500 mg per g for Na; and <0.25 percent for Cl. Soil standards are: 5.5-6.0 for pH; 1.0-3.0 percent for organic carbon; <200 mS per cm for electrical conductivity; <250 mg per kg for Cl; <1.0 meq per 100 g for Na; <10 mg per kg for NO3-N; 100-300 mg per kg for P; 0.5-1.0 meq per 100 g for K; 3.0-5.0 meq per 100 g for Ca; 2.0-4.0 meq per 100 g for Mg; 1.0-3.0 mg per kg for Cu; 2-15 mg per kg for Zn; 10-50 mg per kg for Mn; and 1.0-2.0 mg per kg for B. Trees can take a very long time to respond to applied fertilizers, and a good example is shown for the response of lychee to nitrogen (N). This work followed on from the nutrient surveys. It took four years without N fertilizer to show significant reductions in yield of cultivar Bengal in southern Queensland compared with fertilized trees. Yield increased from 20 to 60 kg per tree as leaf N in August increased from 0.95 to 1.56 percent. In the same study, timing of fertilizer application (summer vs. winter or split between summer and winter) had no effect on yield. These results compare with maximum shoot growth in lychee seedlings in sand culture experiments with leaf N concentrations of 1.4 percent, the maximum N level obtained. The impact of higher N concentrations, up to 2.0 percent on production needs to be investigated, but at this stage, a value of 1.5-1.8 percent is recommended. In contrast to the results obtained for N, similar experiments over three years with P and K on Tai So and Kwai May Pink, gave no symptoms of deficiency or excess with 0 to 2.4 t P per hectare or 0 to 3.2 t K per hectare, which are about ten times industry recommendations. Leaf P and K fell only slightly over time in trees given no fertilizer. Generally, fruit production was similar over the range in leaf P of 0.18-0.44 percent, and leaf K of 0.75-1.37 percent, compared with the industry standards of 0.14-22 percent for P and 0.70-1.10 percent for K. These results suggest that annual applications of P and K may not be required in lychee orchards with large amounts of extractable P and K in the soil, with savings for growers. No further nutrient experiments have been initiated in the past seven years. There have been no data collected to suggest that the rate or timing of fertilizer applications have any influence on flowering. Girdling (cincturing) can be used to control the timing of flushes so that they occur when temperatures are ideal for flowering. Girdling is performed on the lower part of the tree or major branches and involves removing a ring of bark and the conducting tissue below it, down to the hard wood. The ring is cut with a hacksaw, 3 mm wide and deep. Girdling stops shoot growth for two to three months. Once the cut has started to heal, shoot growth is resumed. If temperatures are suitable for floral induction, the new shoots will flower and crop. Experiments have also been conducted to examine the potential of girdling after flowering as a means of increasing fruit retention. Branches were girdled either 0.5 or 1.0 m from the fruit cluster about a month after fruit set. In other experiments, trees were girdled on the trunk just above the soil line. There was a 3-fold increase in the number of fruit at harvest in Tai So branches girdled at 1.5 m from the fruit cluster compared with controls, and a 35 percent increase in yield in Kwai May Pink and Wai Chee trees girdled in the lower trunk. These experiments have shown that girdling can be used to increase production, but further research is required to assess the long-term effects on tree health, before these techniques are widely adopted by industry. Up to 50 percent of the crop can be lost to birds and bats in some orchards. Various forms of netting are effective, but can be expensive, at A$ 8,000 to A$ 20,000 per hectares. However, some of these nets will also exclude fruit piercing moths and, possibly, macadamia nut-borer. Orchards must be profitable for the costs of netting to be viable. In some circumstances, other options are more practical. Lychee is also prone to a great range of invertebrate pests, some of which can seriously reduce yields if not controlled. Protocols exist for determining when to spray for a few of these pests, but for the most part, growers tend to spray according to the calendar and weather. The cost of pesticides is small compared with the higher yields and quality obtained. Erinose mite (Aceria litchi) is a major pest and causes a brown felt-like growth on the developing leaves, flowers and fruit. It can be very difficult to eradicate once established in an orchard. Recommended control is with three sprays of dimethoate or wettable sulphur at two to three week intervals to coincide with the elongation and expansion of new leaf flushes. New marcots should be treated before they are planted. Macadamia nut-borer attacks every season, and can devastate the crop. Larvae mainly develop in green fruit with significant seed development, but before there is a large amount of flesh. Sprays of azinphos-methyl need to be applied to coincide with the hatching of the oldest 10 percent of the eggs so that the newly emerged larvae will be killed before they enter the skin of the fruit. Effective control generally requires a minimum of two to three sprays. Flower caterpillars (Lobesia spp., Isotenes miserana, Prosotas spp. and Phycita leucomiltra) are major but occasional pests, which can be readily controlled with endosulfan or carbaryl. Trees should be sprayed before the flowers open. The fruit spotting bug (Amblypelta nitida) and the banana spotting bug (A. lutescens) are common in southern districts, while the banana spotting bug is limited to central and northern Queensland. These bugs cause the developing green fruit to drop. Generally, lychees are less susceptible once the fruit have started to colour. Two sprays of endosulfan starting two weeks after fruit set will generally provide adequate control. Adult fruit piercing moths (Othreis fullonia and Eudocima salaminia) cause much damage by piercing the skin of ripening fruit and sucking out the juice. No chemical control is available for these large nocturnal moths, although nets with a mesh of 15 to 20 mm will effectively exclude them. These nets will also exclude birds and flying foxes. A smaller mesh with a cross hair would also keep out some macadamia nut-borer and elephant beetles. These cost from A$ 15,000 to A$ 25,000 per hectare. The season commences with cultivars Fay Zee Siu in northern Queensland in October and finishes with cultivar Wai Chee in northern New South Wales in March. At any one location, harvesting normally lasts about six weeks with a spread of cultivars. Fruit do not ripen off the tree, so must be picked mature as indicated by a minimum brix:acid ratio of 35:1 (ripe fruit generally have a much higher ratio). Maturity can be judged by the shape, size, colour and flavour of the fruit, which varies greatly with cultivar. Fruit become bland if picked over-mature. Fruit should be harvested early in the morning before they warm up. Some growers pick early season fruit individually off the panicle (spot picking). Generally, however, the bulk of the crop is picked in clusters. Once lychees are picked, they start to dry out and brown. Fruit should be kept in a high humidity and cooled to 5°C as quickly as possible. Hydro-coolers or cool rooms are frequently used for this purpose. After picking, fruit are destalked and sorted visually on mechanical conveyors to remove small, poorly coloured or damaged specimens. Industry quality standards have been developed. Extra class must be practically free of defects, and typically comprises no more than 10 percent of the crop. First class fruit can have moderate defects with skin blemishes not exceeding 60 mm2 in total on any one fruit. Other standards operate for other segments of the industry that have a commitment to quality assurance and are members of the United Lychee Marketing Association (ULMA). To reduce water loss and browning, fruit are marketed in bulk packages in 9 L cartons that hold 5 kg of fruit and packed in two 2.5 kg low-density crispywrap bags (with small pores) or polybags. Fruit can also be packed in 250 g punnets, with a cling wrap film. Fruit should be free of surface moisture before being packed to reduce the potential for disease development. Fruit are normally shipping by refrigerated road transport. This system retains the red skin colour and greatly prolongs shelf-life. However, once the retailers open the bulk packs, fruit begin to deteriorate under air conditioning in the stores. Research into extending shelf-life was active in the mid-1980s and again in the early 1990s. Lychees deteriorate rapidly after harvest. Several strategies have been developed to extend the shelf-life of fruit, and thereby reduce the considerable wastage that occurs through the marketing chain. Fruit dipped in hot benomyl and stored in punnets with PVC wrap keep for several days at room temperature, but the technology is not practicable. Experiments have also been conducted with sulfur, acid dips, hydro-cooling and other techniques to maintain the red skin, but none of this research has improved eating quality. CSIRO Plant Industry in Brisbane and Sydney is examining new approaches. Fruit are sold at the farm gate, consigned to the wholesale markets in Brisbane, Sydney or Melbourne or exported. Growers can handle marketing individually or join one of the lychee marketing groups. If sending fruit to some of the southern markets, quarantine restrictions must be adhered to. These restrictions vary from season to season. The bulk of production is sold locally either at the farm gate or through the central markets, with about 30 percent exported. Exports have risen sharply in the past few years with improvements in post harvest handling and the development of cooperative marketing groups and quality assurance programmes. These groups export about 60 percent of their crop. The main markets are Hong Kong, Singapore, French Polynesia, United Arab Emirates and the United Kingdom. Average net returns to the growers are about A$ 5.50 per kg. This is after taking into account the costs of freight, commissions and agents fees etc. At this stage the lucrative markets of Japan and the United States are not available due to quarantine restrictions associated with lychee being considered a host of fruit fly. Marketing groups were established in the early 1990s, and are now the largest exporters. Groups are based in northern, central and southern Queensland. They typically have a market coordinator, rigorous grade standards and quality assurance training, and pack their fruit into distinctive cartons that are readily identifiable in the marketplace. The groups generally achieve a premium of A$ 1 to A$ 2 per kg above the average market price. Average prices have increased over the past few years despite an increase in production. The Industry has the objective of producing 1 percent of the worlds lychees by 2010. With total world production of about 1 million tonnes, this represents a crop of about 10,000 tonnes, nearly three times present production. Australia has many advantages in growing and marketing lychees. Production and post-harvest technology is reasonably advanced. Many growers have a business background bringing with them new skills, innovation and off-farm income. The production season is long, stretching from October in northern districts to March in southern areas, while the main cultivar, Kwai May Pink is well respected in domestic and export markets. The industry also has a long history of grade standards, quality assurance and cooperative marketing. There has also been a strong commitment to exporting. Australia has a number of real advantages when competing with Madagascar, South Africa and Reunion. Whereas most fruit exported from these Southern Hemisphere competitors is chemically treated, Australian fruit do not receive any post-harvest sprays or dips. Australia also has close proximity to the expanding Asian market where it can supply fruit out-of-season. The close association between industry and research providers also offers a competitive advantage to Australian growers. The industry is based in Queensland, with a few growers in northern New South Wales. Farms are scattered along the eastern coastline across a range of climates, soil types, pest pressures, availabilities and costs of labour, and distances to markets. There are few farms given entirely over to lychee production. Income from lychee is commonly supplemented with income from other crops or from off-farm sources. Most orchards are relatively small, with fewer than 1,000 trees. While the returns for lychee can be very lucrative, there are risks associated with its production and marketing. Many orchards are inherently low yielding due to the cultivar selected or the location of the planting. Even in an ideal location, there can be problems with flowering or fruit set. The crop is also susceptible to a broad range of pests, while harvesting and packing are very labour intensive and costly. The fruit are susceptible to browning and rotting, and thus have a relatively short shelf-life when stored and transported under existing technology. This creates problems in both the domestic and export markets, even for growers committed to grade and quality standards. The industry has come a long way since the First National Conference on the Sunshine Coast in 1986. Production has expanded and markets grown, but probably not at the rate suggested some fifteen years ago. There were several resolutions passed at the Nambour Conference that have impacted on the lychee industry. Grade and maturity standards have been developed, and the peak industry body, the Australian Lychee Growers Association was formed in the late 1980s. There was also a call at the Conference to investigate irregular bearing, and to develop post-harvest technology. There can be no doubt that problems with flowering and fruit set still affect lychee trees in Australia. However, there have been significant improvements in our understanding of the effects of cultivar and weather on performance, and better recommendations for canopy management, watering, nutrition and pest control. Average yields in many districts have increased over the past decade, with prices generally well above the predicted figure of A$ 2.50 to A$ 3.00 suggested in 1986. We also have a better understanding of post-harvest and marketing issues. However, a significant improvement in shelf-life is still a few years away. It will be some time before better cultivars are developed for tropical coastal areas. Production is only consistent when early bud growth in winter coincides with several days of low temperatures. This is more likely on the Atherton Tableland in northern Queensland, and in southern Queensland and northern New South Wales. It is difficult to manage the trees for consistent cropping in tropical environments such as coastal far north Queensland. The local industry needs to consider developing new cultivars so as not to be completely dependent on a single cultivar that could become susceptible to a new pest or disease in the future. A single cultivar has a short harvesting season in individual orchards. There has been limited breeding of lychees in China, Thailand, Israel and South Africa, and virtually none in Australia. At the moment, the Australian industry does not have the resources to support a well-developed breeding programme, that would cost A$ 50,000 per annum or more. The cost of maintaining seedling blocks is at least A$ 5,000 to A$ 10,000 per hectare. At this stage, the emphasis would probably be on conventional breeding and selection, but there could be a role for biotechnology later. The main objectives would be improvements in production (regular and heavy yields), tree shape and fruit quality (seed size), along with earlier or later harvesting. In the short-term, it might be advantageous to link into existing programmes overseas, or at least import some of the better cultivars. It would also be useful to evaluate the performance of existing overseas cultivars in a systematic way. Guidelines are available on the optimum time to prune the trees after harvest to control tree size, but the optimum tree shape and canopy size have not been established. Studies in this area have lead to increased efficiency in temperate deciduous fruit orchards, but are rare in tropical trees. This research could possibly include related crops such as longan and rambutan, and would build on earlier canopy experiments. Guidelines are available for water and nutrient management. Irrigation is essential in northern Queensland, especially on the Atherton Tableland, but may not always be required in certain areas in southern Queensland and northern New South Wales. Droughting trees could be used to control flushing patterns and improve flowering in localities with dry winters, but has not been exploited apart from some areas in Israel and South Africa. The timing and duration of the water deficit for success in Australia are not known. There is also some indication that a light drought could direct resources to the fruit rather than new shoots under some circumstances, but commercial recommendations are not available. Growers generally irrigate their orchards on the basis of long-term evaporation data from a Class A pan, or just from experience. This easily translates into under- or over-watering. Research indicates that a long irrigation once a week is more than adequate in most areas. This would be excessive in all but the driest orchards. Maximum water use would be about 60 mm per week. Soil water can be monitored with the use of EnviroScans or similar devices, but these are expensive and impractical when there are several soil types in an orchard. They also need to be calibrated. New systems are now available, with one instrument measuring several sites. It is possible that the increased cost of irrigation water will make these more widely used in the future. Most growers base their fertilizer applications on the results of soil and leaf tests. It is unlikely that the standard values will change significantly with new cultivars or growing areas. It is possible that increases in yields could occur with higher tree nitrogen (N) status above 1.8 percent in the leaves, whereas there is probably no benefit in increasing the application of other nutrients. Future nutrition recommendations will probably be more concerned with limiting the cost to the environment. Slow release fertilizers and fertigation will become more common. At this stage, there is no evidence that the rate or timing of nutrient applications have any effect on flowering. The main insect pests are erinose mite, fruit spotting bug and macadamia nut-borer. There can also be problems with flower caterpillars and fruit piercing moths in some seasons. Current strategies generally employ calendar sprays with little monitoring. In the future, there will probably be a shift to monitoring and strategic applications, with possible biological control for mite and nut-borer. There also needs to be a change in pesticide label directions for tree crops that are currently based on application rates rather than on dose per tree. Exclusion nets currently appear to be the most effective control for birds and flying foxes, but orchards must be productive for the system to be economically viable. With a small aperture, the netting can control piercing moth and possibly even nut-borer. Insecticides could even be applied to the nets. Various options are being considered by the Flying Fox Consultative Committee. It is quite feasible that future orchards will use very few chemicals to control pests. This can only enhance the green image of lychee in the market place. The bulk of the crop produced in Australia is refrigerated after harvest, sometimes with hydro-cooling, and marketed in 2.5 kg crispywrap bags. The newer bags allow for some moisture loss, so there is less of a problem with rots, unless the fruit are very wet or are stored for long periods. The main problem is that the fruit dry out within a day or so of opening the bags in the shops, and turn brown, although occasionally there may also be browning within the bags. The industry is hoping to move to punnets before too long, but this technology will require some pre-harvest/post-harvest treatment to reduce breakdown. Ideally, these treatments will be based on biological products. The role of temperature during the marketing of punneted fruit is yet to be determined. These treatments will be more attractive than those based on sulphur, acids and heating and cooling. Research is continuing. There have been some recent developments in Israel based on a heating/cooling cycle, but there were some problems with this technology in Australia. The price in the domestic market has been about A$ 5 to A$ 6 per kg for the past five seasons, despite the prediction that it would fall to A$ 3 with increasing production. There can be no doubt that the development of marketing groups, such as Sun Lychee, and their commitment to grade standards, quality assurance, and the development of export markets have contributed to the success in recent years. Exports have been mainly to Singapore, Hong Kong, Europe, the Middle East and the Pacific Islands, but short shelf-life, small production and limited airfreight services are significant hurdles to the expansion of these markets. There is also a trade restriction on direct entry of fruit into China, and a quarantine restriction with respect to the USA market, because of the listing of lychee as a host for Queensland fruit fly. China has applied to export lychees, and the Australian Quarantine and Inspection Service (AQIS) is currently reviewing this application. If successful, Australian growers will apply for access to the Chinese market. In the domestic market, the majority of lychees are consigned to Brisbane, Sydney and Melbourne. There is a requirement that Queensland lychees must have unbroken skin when sent to Victoria as a precaution against fruit fly, otherwise the fruit must be dipped in dimethoate. There are also restrictions for other southern markets. Across these markets, there are food-safety/preferred-supplier-certification issues that need to be addressed by the industry in the next few years. Domestic sales have occurred with little or no advertising in Australia. Whether the market will continue to grow without promotion is yet to be determined. A longer shelf-life would be a good starting point. There has been the suggestion that one of the major chains is prepared to move to fruit in punnets. This can only be a positive development for the industry. The Queensland Department of Primary Industries (QDPI), New South Wales Agriculture (NSW Ag) and the Commonwealth Scientific and Industrial Research Organization (CSIRO) have traditionally provided research, development and extension. The support of individual growers, nurseries and industry leaders has also been substantial. Queensland, New South Wales and the Commonwealth have funded most of this work. It has been estimated that from 1981 to 1999, the QDPI, NSW Ag and CSIRO contributed about A$ 4 million and external agencies some A$ 1.3 million towards research. Industry contributed about A$ 200,000. The Queensland Fruit and Vegetable Growers (QFVGs) levy on lychee sales generates about A$ 40,000 per year that is currently matched by the Rural Industries Research and Development Corporation (RIRDC). This levy can fund about one large research project. Activities at the moment include a CSIRO Post-Harvest Project, and one by a private consultant on the fruit disease pepper spot. The QDPI does not have any current research projects. NSW Ag withdrew from lychee research and extension in the mid 1990s. The lychee industry organizes a national conference every four years, and an industry newsletter, Living Lychee is produced every three months. The QDPI has produced Growing Lychee in Queensland and the Lychee Information Kit (Agrilink) that form the basis of industry extension. CSIRO is not active in industry extension. Lychee was introduced into Australia more than 60 years ago, but major commercial plantings commenced only in the 1970s. Currently, there are about 320 growers with an annual production of 3,500 tonnes worth A$ 12-15 million. Production has steadily increased over the past few years. About 50 percent of commercial plantings are found in northern Queensland, 40 percent in southern Queensland, and the balance in northern New South Wales. Successful production requires experience and expertise in managing irrigation, tree nutrition and pest control. Efficient packing and cool room facilities are needed as the crop deteriorates very quickly after harvest. The Australian industry has a vision to represent 1 percent of world production by 2010, currently about 1.0 million tonnes. Hence, the local industry needs to grow by three-fold in the next decade or so. There is also the expectation that the industry will be well regarded in both the domestic and international markets, as a reliable supplier of quality clean fruit. These objectives will only be realized with considerable effort from industry and research providers. Opportunities for increasing production include new cultivars and better methods of orchard management and pest control. There will also need to be improvements in the post-harvest treatment and marketing of the crop. These developments are more likely to succeed if industry remains united in its vision for the future. Growers also need to consider options for research and development, information transfer and industry organization. Initial research, development and extension in the late 1970s and early 1980s involved the introduction of cultivars from overseas, and their evaluation for commercial production along with local selections. Efforts were then directed towards understanding the basic physiology of flowering and fruit development, and the impact of tree management on production. There have also been efforts to improve the post-harvest life and marketing of the crop and to coordinate the development of the industry across Australia. 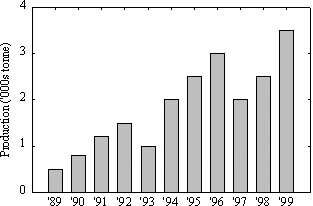 Research was most active in the mid- to late 1980s, and accounted for about 30 percent of world scientific output (publications) on the crop during this period. Most of this activity was at Maroochy Research Station, the Hamilton Post-Harvest Laboratory (QDPI) and CSIRO. Current R&D is only a fraction of that during the initial development of the industry, although it could be argued that the need is just as great, especially as demand for fruit in export markets rises. Many thanks are expressed to Don Simpson, Neil Greer, Trevor Olesen, Cameron McConchie and Susanna Hieke.